Place bread cubes in a greased 13-in. x 9-in. baking dish. 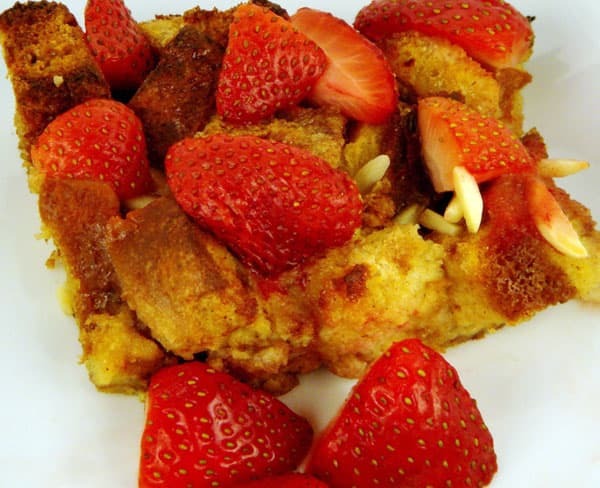 In a bowl, combine eggs, milk, ¾ cup brown sugar, and cinnamon. Pour mixture over bread. Cover and put in freezer for one hour. Remove from freezer; sprinkle almonds over egg and bread mixture. Combine butter and remaining brown sugar; drizzle over the top. Bake, uncovered, at 400˚ for 20 minutes. Sprinkle with strawberries. Bake 5 more minutes or until a toothpick can be inserted in the middle and come out clean.